Haluk Akakçe’s new exhibition opened at Richard Taittinger Gallery in New York. The crowd outside that gathered after midnight became a part of the opening that lasted until morning. Akakçe’s new works, herald an exciting direction in the artist’s pictorial vernacular. Inside are Haluk Akakçe’s new works. Come Midnight named exhibition, as its name suggests, is to open at midnight, and the opening is to last until eight in the morning. Come Midnight which may be viewed until June 21st, is Akakçe’s first exhibition held in New York after a nearly ten-year hiatus. Except, before the opening of this promising exhibition, we are being forced to wait at “the door”. As preparations are under way in the gallery, I am thinking the wait could be part of the strategy – maybe to create a little more excitement? After all we are talking about Haluk Akakçe. We’re talking about his playful world. Long before this exhibition, again in New York, I had met with Haluk Akakçe. At the time, Come Midnight, was still a work-in-progress. 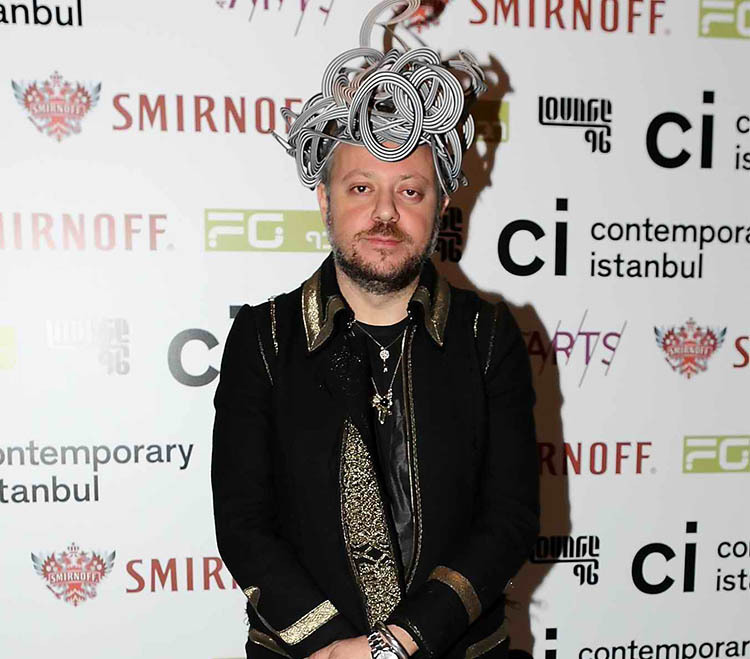 Akakçe had spoken of how important producing new works is to him. During breakfast one gloomy day, I understood once more; the “artist” Haluk Akakçe is one, the one presenting his art to the outside world another, the art and the outside world aside, Haluk Akakçe is yet another. I must have reached the third Akakçe when we spoke more of our mothers, youth, Banu Alkan and my recommendation whether he would possibly keep a daily diary similar to Dali, Warhol, and Keith Haring. While saying our goodbyes after breakfast I understood very well that the three Akakçes were thus split so as make the whole. Determining Haluk Akakçe’s place in our art world is not a one step process. Again we have on our hands divided meanings. He not only found the success denied so many others, but where he has arrived he dazzles with his brilliance. His art, not only suffers the weight of “alienation” relative to the art world, but quickly came and found itself sitting right at its center. Even if known to multiply his image with his many hats and sayings, instead he always attracted solitude. Solitude is perhaps the word that represents the foundation of Akakçe’s art. Because we can weave this word through the concepts of time, youth, the inside and outside, the mundane to the infinite and begin to arrive at an understanding of Akakçe. This word also gives shape to Akakçe’s choice to be a painter. Akakçe is like the illegitimate child born to a marriage between surrealism and pop art. Akakçe, stands equidistant between Joan Miró and Keith Haring. His oval brushstrokes while a reflection of uncertainty and constantly changing decisions, the base of the paintings occasionally left perfectly blank and occasionally interrupted with geometric shapes, symbolize the certainty, focus and absolute decision. An Akakçe painting, with its minimal fluctuations appears sometimes to be advancing the field of scope, while at other times a single detail carries the whole piece in several different directions. Akakçe’s videos and their placement escape their atmosphere of self-longing: finally we are faced with objectivity’s playfulness, its flirtatious magnetism or its brutality and coldness. In Come Midnight, Haluk Akakçe unique divisions and the sums of the divisions adding up to more than the whole are fittingly represented in his works The Awakening and Sunshine on Her Shoulders. Both paintings were created in 2015 and in Akakçe dialect herald exciting news. The two paintings in front of us are works created at the evolution between surrealism and abstract expressionism. Speaking of abstract expressionism, and considering its still very current trend in the United States, we could also have predicted these works to surface. In these paintings, Akakçe’s brushstrokes are forceful, haphazard and chaotic. They are somehow reminiscent of Franz Kline. But in contrast to Kline’s negatively alienating works, Akakçe’s two masterpieces have movement that forcefully draws one in. It’s as if Akakçe has inspected his previous works under a magnifying glass and brought his observations to the canvas. Likewise, situated at the end of the exhibition, the Moonlight Serenade video continues to expose these microscopic observations. This time, the butterfly-esque figure symbolizing the fragile nature of the past, in its cyclical movement, at once thunderously disappears and at the same time is born again in a soft glide. Watching the video my mind was tampered with one thought: should the sharpness of the paintings inside have been continued here? The piecing of those paintings transported to the video could have pushed the innovation one step farther. What comes out of the other works in the exhibition is Akakçe’s reduced color palette. We find in the frame many areas left clean, areas left white. The density of the whites, help to unite the works in the context of “point zero”. The exact point between day and night, for Akakçe, are the white areas in his canvas. The nine drawings carefully placed on a wall of the exhibition of this strange landscape, they evoke the dreams of an artist – a guest of this point zero – who has fallen asleep. Sometimes framed by a few lines, sometimes trying to adhere to form, searching for physicality, these drawings unique to Akakçe, are immediately attributable to him in their aesthetic. On the path of the large paintings next to each other, The Awakening and Sunshine on Her Shoulders, they can be a bit overwhelming. Among all the works that complete the exhibition, one could certainly have been left without. Akakçe as much as he has moved away from his predominant use of color, one wall could have been lightened up so. Come Midnight is not only an exhibition that summarizes Akakçe’s art after a ten-year New York hiatus but also establishes new directions. It’s a touching, melancholic and beautiful exhibition. An exhibition where its very foundational meanings, and very foundational imagery, have, by measure of the artist’s inner calculations, been successfully expressed.